Does your lot feature potholes like this? Parking lots take a beating over the years. Vehicle and foot traffic, combined with the natural elements can take a toll on the surface of a parking lot. It is important to realize that parking lots will require a fair amount of maintenance of the years. If your lot is not adequately maintained, it will likely reflect poorly on your business and hurt its image. Many business owners are long overdue for parking lot maintenance and just don’t know it. We have compiled a list of a few clear signs that your parking lot needs maintenance. One of the most obvious signs that your parking lot need some attention is potholes. They are a common form of asphalt damage that present a significant safety hazard. Not only are they an inconvenience, but they are also hurt your curb appeal. They are formed when water accumulated under the surface. When there is pressure from vehicles is applied to the surface, a pothole can form. 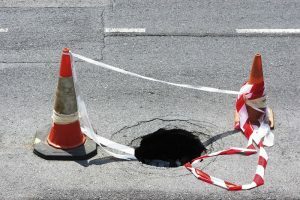 If you have a pothole on your lot, you want to have it patched right away to keep everyone safe. Many parking lots suffer from insufficient drainage, which leads to cracking. When cracks form in your lot, grass may start to grow through them. You can either seal the cracks or create a better drainage system in your lot. Asphalt does not last forever. Over the years, asphalt will begin to deteriorate, which often leads to cracks in the surface. Cracking is often the result of light exposure, poor draining, and excessive moisture. In most cases, minor cracks can be fixed through filling or patching. Does your parking lot feature a few greasy spots left from oil? Not only do they unsightly spots hurt the appearance of your lot, but it will cause damage to the asphalt by making it less adhesive. To prevent the damage caused by inevitable oil spots, you may want to consider using a sealant on your lot. This entry was posted on Wednesday, March 27th, 2019	at 5:46 pm	and is filed under Parking Lot Repaving	. You can follow any responses to this entry through the RSS 2.0	feed. Both comments and pings are currently closed.